Art created using a 3D printer has the potential for combining utility and stunning detail. 3D Printers are changing the way we approach fabrication and design, and I’ve just seen proof that they’re impacting art as well. The M museum in Leuven, Belgium is running an amazing exhibition of sculpture created using 3D printers. The Parallellipipeda Project (named after the geometric shape), features art that takes full advantage of the unique capabilities of the new technology. Insane furniture, spiraling light fixtures, and random pieces of mind twisting sculpture are on display now through February 11. There’s even a large 3D scanner from Eyetronics so you become part of the experience. If you’re like me and don’t have the funds to jaunt off to Belgium, don’t worry. One of the sponsors of the exhibit, iMaterialise, has posted a video of some of the amazing pieces from the show. Watch it below. i Materialise is a 3D printing and production company. They’ve worked with various artists to produce a gallery of modern sculpture based on using three dimensional printing. Much of the Belgian exhibit comes out of this .MGX gallery. The cool part of 3D printing, is that an artist produces a design, not the actual piece. That means you can replicate any artwork many times like some sort of Andy Warhol fantasy. It also means that others can modify and remix the files you make public. We’ve already seen some of this in the online communities built around open source 3D printers for your home. Makerbot always has some impressive 3D art in their galleries. As 3D printers move into the mainstream, we’re going to see a lot more of this sort of design based art that can be massed produced and shared. Art will be democratized. Some day, you’ll be able to see amazing exhibits like the one in Belgium, and then go home and print out the pieces that you like. 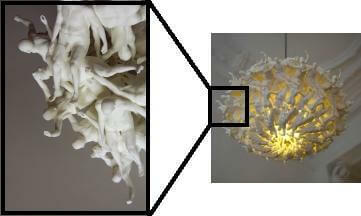 The technology of 3D printing will take sculpture from rare to universal. Great art will still be priceless…just in the opposite sense we’re used to. I can’t wait.